This property management agreement is to be used when a commercial property is owned by several tenants in common (cotenancy), as opposed to one legal entity. This often occurs when property is held by family members, or investment affiliates. The agreement appoints one cotenant to manage the property which is leased on a net basis to a third party tenant. The agreement provides for prorata distributions to the cotenants based upon their ownership interests, and specifies the compensation of the managing cotenant. It also contains other elements often found in cotenancy agreements such as a right of first refusal for cotenants to purchase the interest of any selling cotenant before the interest is offered to third parties. THIS COTENANCY AGREEMENT, made and entered into as of ___________________, by and between _______________ (hereinafter called "Cotenancy Manager"), _______________, (hereinafter called "Cotenant One"), _______________, (hereinafter called "Cotenant Two"), _______________, (hereinafter called "Cotenant Three"), _______________, (hereinafter called "Cotenant Four"), and _______________, (hereinafter called "Cotenant Five"). The Cotenancy Manager and the foregoing other Cotenants are sometimes hereinafter collectively referred to as the "Cotenants." WHEREAS, The parties hereto wish to provide for: the orderly monitoring of performance by the present tenant of the Premises under the triple net lease agreement for the Premises; if necessary, upon a vacancy in the Premises, the operation and management of the Premises; the continued occupancy of space within the Premises; and, the distribution of income from and the pro-rata sharing in expenses of the Premises by Cotenancy Manager in connection with Cotenant One's interest in the Premises. 1. 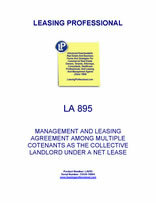 The Cotenants, subject to the limitations and power of revocation herein expressed, hereby designate Cotenancy Manager as their sole and exclusive agent and delegate to Cotenancy Manager the sole right to monitor and enforce on behalf of the Cotenants the terms of the present lease of the Premises, including but not limited to any amendments, consents to assignment, sublet, releases or modifications to the lease or guarantees of lease and to deal with any property agent or tenant. Should the Premises become vacant, the operation and management of the Premises, is delegated by the Cotenants, subject to revocation on an individual basis by an individual Cotenant as otherwise set forth herein, to Cotenancy Manager, or its designated agent, successors or assigns. In the event the Cotenancy Manager sells all of its interest in the Premises, (or shall no longer be delegated the operation and management of the Premises), the duties and obligations of Cotenancy Manager respecting management of the Premises as set forth herein, including but not limited to its duties and obligations respecting paragraphs 2, 3, and 4 hereof, shall be exercised by the holder or holders of a majority undivided Cotenancy interests in the Premises. Subject to the approval of all Cotenants evidenced by their written consent, Cotenancy Manager shall negotiate and execute new leases of the Premises upon termination of the present lease of the Premises or negotiate and execute easements or other instruments affecting the Premises, may incur ordinary and necessary operating expenses in connection with the management of the Premises, and propose extraordinary or capital expenditures to the Premises. Until the Cotenants shall revoke such authority as provided herein, Cotenancy Manager or the Cotenants themselves may obligate the Cotenants with respect to any ordinary and necessary operating expense for the Premises. However, Cotenancy Manager has no right to obtain a loan for which any other Cotenant would be liable, nor may Cotenancy Manager finance or refinance the Premises by secured by any lien or any pledge of the Premises. The Cotenants agrees to execute and deliver to Cotenancy Manager such written approval of documents approved by The Cotenants, such approval to take such form as may be reasonably required by Cotenancy Manager to evidence its authority to sign approved documents on behalf of the Cotenants. As further set forth in paragraph 2 hereof, Cotenancy Manager agrees to require any lessee of the Premises to name the Cotenants as an insured or additional insured in all insurance policies provided for, or contemplated by, any lease on the Premises. Cotenancy Manager shall use its best efforts to obtain endorsements adding Cotenants to such policies from lessee within 30 days of commencement of this agreement. In any event, Cotenancy Manager shall distribute any insurance proceeds it may receive, to the extent consistent with any lease on the Premises, to the Cotenants in proportion to their respective ownership of the Premises. 2. Income and expenses shall be allocated among the Cotenants in proportion to their respective share(s) of ownership. Shares of net income shall be pro-rated for any partial calendar years included within the term of this Agreement. Cotenancy Manager may offset against, pay to itself and deduct from any payment due to the Cotenants under this Agreement, and may pay to itself the amount of the Cotenants's share of any reasonable expenses of the Premises which are not paid by the Cotenants to Cotenancy Manager or its assigns, within ten (10) days after demand by Cotenancy Manager. In the event there is insufficient operating income from which to deduct the Cotenants's unpaid share of operating expenses, Cotenancy Manager may pursue any and all legal remedies for collection. Operating Expenses shall include all normal operating expense, including but not limited to: maintenance, utilities, supplies, labor, management, advertising and promotional expenses, salaries and wages of rental and management personnel, leasing commissions to third parties, a monthly accrual to pay insurance premiums, real estate taxes, installments of special assessments and for structural repairs and replacements, management fees, legal fees and accounting fees, but excluding all operating expenses paid by tenant under terms of any lease agreement of the Premises. The Cotenants have elected to retain, and agree to annually compensate, Cotenancy Manager in the amount of $______ for the expenses, direct and indirect, incurred by Cotenancy Manager in providing the Cotenants with quarterly accounting and distributions of each Cotenants's share of net income and for tracking, reporting and assessing the calculation of each Cotenant’s share of operating expenses incurred from the Premises. This invoice amount shall be pro-rated for partial years and the Cotenants authorize Cotenancy Manager to deduct such amount from each Cotenant’s share of revenue from the Premises. The Cotenants may terminate this agreement in this paragraph respecting accounting and distributions at any time and attempt to collect their share of rental income directly from the tenant occupying the Premises; Cotenancy Manager may terminate its obligation under this paragraph upon thirty (30) days written notice to the Cotenants prior to the end of each anniversary hereof, unless agreed in writing to the contrary. 3. Full, accurate and complete books of account shall be kept in accordance with generally accepted accounting principles at Cotenancy Manager's principal office, and each Cotenant shall have access to such books and may inspect and copy any part thereof during normal business hours. Within ninety (90) days after the end of each calendar year during the term hereof, Cotenancy Manager shall prepare an accurate income statement for the ownership of the Premises for such calendar year and shall furnish copies of the same to all Cotenants. Quarterly, in accordance with its pro-rata share, each Cotenant shall be entitled to receive of all items of income and expense generated by the Premises. Upon receipt of such accounting, if the payments received by each Cotenant pursuant to this Paragraph 3 do not equal, in the aggregate, the amounts which each are entitled to receive proportional to its share of ownership with respect to such calendar year pursuant to Paragraph 2 hereof, an appropriate adjustment shall be made so that each Cotenant receives the amount to which it is entitled. 4. If Net Income from the Premises is less than $0.00 (i.e., the Premises operates at a loss), or if capital improvements, repairs, and/or replacements, for which adequate reserves do not exist, need to be made to the Premises, the Cotenants, upon receipt of a written request therefore from Cotenancy Manager shall, within fifteen (15) business days after receipt of notice, make payment to Cotenancy Manager sufficient to pay such net operating losses and to provide necessary operating capital for the Premises and to pay for such capital improvements, repairs and/or replacements, all in proportion to their undivided interests in and to the Premises. All Cotenants shall have the right to review all contracts that will have a material effect on the Premises. All Cotenants shall have the right to approve budgets and major capital expenditures affecting the Premises. For so long as Cotenancy Manager owns an interest in the Premises, the Cotenants agree to delegate the determination of such budgets and need for capital expenditures to Cotenancy Manager subject to the power of any Cotenant to revoke such delegation in accordance with the provisions hereof.